Momentous motor sports events that took place during this weekend in history …..
1945: Hershel McGriff passed George Amick on the last lap to win the first race, a 100-lap event, on the newly paved Portland Speedway in Portland, Oregon, US. Alberto Ascari in his # 2 Ferrari 375 and Froilan Gonzales in his # 6 Ferrari 375 heading for a 1 – 2 victory during the 1951 Italian Grand Prix. 1951: Alberto Ascari in a Ferrari 375 won the Italian Grand Prix at Monza. 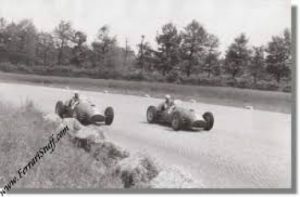 Ascari’s victory took him to within two points of Championship leader Fangio, while Jose González was a further four points behind in third. Only Juan Manuel Fangio and Ascari remained in contention for the Drivers’ Championship with one race remaining, as not even a win would suffice for González to overhaul his fellow Argentinian’s points haul. 1955: The USAC was formed by Indianapolis Motor Speedway owner Tony Hulman after the American Automobile Association (AAA) withdrew from auto racing following the 1955 Le Mans disaster. It became the arbiter of rules, car design, and other matters for what it termed championship auto racing. The USAC’s long history as on open-wheel sanctioning body continues today with the Silver Crown Series, National Sprint Car Series, National Midget Series, Ignite Ethanol Fuel Series, .25 Midget Series, and Traxxas TORC Series. 1962: Edoardo Lualdi won the Sarezzo-Lumezzani Hillclimb in Italy driving a Ferrari 250 GTO. 1962: Graham Hill led home Richie Ginther for a BRM 1-2 at the Italian Grand Prix at Monza. 1973: David Pearson rolled to one of his series-high 11 wins of the season, holding off Bobby Allison by 1.8 seconds at the finish of the Delaware 500 at Dover International Speedway, US. Pearson, who started from the pole in a Wood Brothers Mercury, led 344 of the 500 laps. Allison and Buddy Baker completed the top three as the only other drivers to finish on the lead lap. 1978: At Santa Pods Raceway’s September Internationals Sammy Miller made his UK debut with the ‘Vanishing Point’ rocket funny car, breaking all existing records with a quickest elapsed time of 4.41/245.6mph. His slowest run was only 4.94/225mph! Sammys best terminal speed of the weekend was 290 mph, just missing out on the £5000 prize Santa Pod had put up for Europes first 300mph run. Santa Pod gave him £2500 for coming so close. 1984: Stefan Bellof and Hans Stuck drove a Brun Porsche 956 to victory in the World Endurance Championship race at Imola, Italy. 2001: The Italian Grand Prix took place in the shadow of terrorist attacks in the USA five days earlier. Serious consideration was given to cancelling the race but it did go ahead albeit in a sombre atmosphere, and the Ferraris sported black nose cones as a mark of respect. Michael Schumacher tried to organise a pact with the other drivers not to overtake at the first two corners but this was scuppered when Jacques Villeneuve refused to comply. Juan Pablo Montoya went on to score his maiden win in Formula One, while Schumacher finished fourth. 1904: The first speed trials on sands in the British Isles were held in Portmanock, Dublin. 1908: The Italian Zust arrived in Paris, 49 days after the victorious Thomas Flyer as the third and last of the 6 starters to complete the New York to Paris Race. 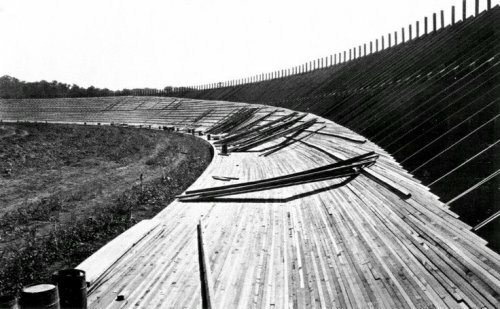 1922: The Kansas City Board Track (US) staged its first event, a 300-mile race. Jack Prince and Art Pillsbury (who also built a several such tracks including the Beverly Hills Speedway) built the track in 1922 at a cost of $500,000. The 1.25 mile wood oval track had high banked turns, two grandstands, and parking for 20,000 automobiles, including 5,000 in the infield. The racetrack itself was located near what is now 95th and Troost, and the main entrance was located at 94th and Holmes Rd. The first race was scheduled for September 16, 1922, but rain delayed the race until the following day. More than 50,000 people attended the first of only four auto races that would ever be held at the Kansas City Speedway, which also hosted motorcycle racing. Notable attendees at the first race included the Mayor of Kansas City, Missouri Governor Arthur Hyde, and great race car drivers, including Ray Harroun and Barney Oldfield. 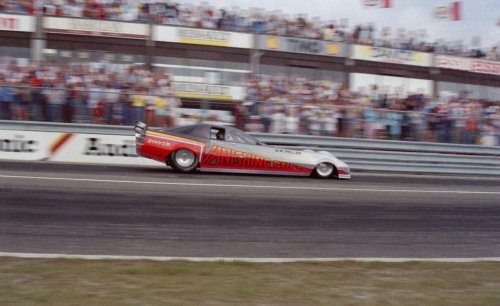 Seventeen drivers participated in the first race, including Tommy Milton, Leon Duray, Tony Gulotta, and Cliff Durant. The race was won by Tommy Milton, who was also the first driver to win the Indianapolis 500 twice. The first race also saw the only fatality at the track when the race claimed the life of 27-year-old Roscoe Sarles who collided with Pete Depaola on the 110th lap. The average speed for the first race was 107 mph, which was significantly faster than Indianapolis 500 races of that time. In fact, the average speed at Indianapolis did not exceed 100 mph until 1925.In 1924, the last race, a 250-mile event, was stopped after about 150 miles because large holes had appeared in the wood track. 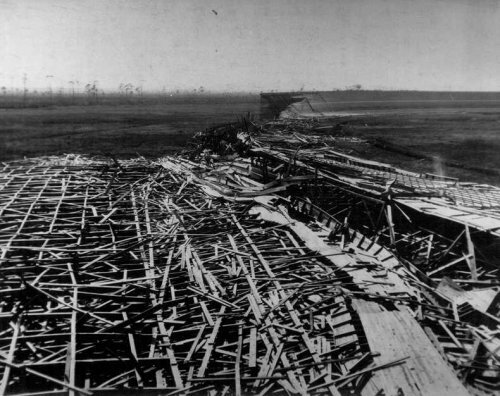 The nearby Blue River caused the untreated lumber used in constructing the track to warp. Jimmy Murphy won the fourth and final auto race on July 4, 1924. The speedway was sold on March 24, 1925, for only $97,500. 1924: Ralph DePalma driving a stock Chrysler covered 1,000 miles in 1,007 minutes at the board track in Fresno, California, US. 1926: The Fulford Speedway in Miami Beach, Florida, US was destroyed by the Great Miami Hurricane; the lumber that comprised the track’s surface was scattered across the neighborhood, and was later, after being recovered, used by the city for reconstruction. After its destruction, the area was taken over by the Presidential County Club. South Florida did not have a major auto race again until 1983, when the Grand Prix of Miami was held on a street circuit in downtown Miami. 1988: Michael Waltrip bypassed Tommy Ellis with 12 laps left and led the rest of his first NASCAR Nationwide Series victory, prevailing in the Grand National 200 at Dover International Speedway, Delaware, US. Waltrip, who drove a car owned by his brother Darrell, won in just his third start in the series. He led 37 of the 200 laps at the Monster Mile and pulled away to a .685-second triumph over Ellis. Morgan Shepherd finished third.